Originally published by Athens Indymedia (here announcement 1, 2, 3 and 4). Translated by Black Cat. Announcement at 7:15 am Today at 6:45 antiterrorism units invaded Korydallos prison and proceeded to the violent kidnapping of the anarchist hunger striker Konstantinos Giagtzoglou. Konstantinos resisted as much as he could, but the antiterrorism cops along with other uniformed and hooded police officers stormed in his cell and assaulted him. Next they handcuffed him and removed him violently while he had almost passed out. The wing of the prison was locked at the time and the prisoners were banging on the doors and insuting the cops. At this point the prison is not open yet and the cells remain locked. Announcement at 7:39 am Konstantinos Giagtzoglou has just left the prison in the van of the Tansfer Unit which is escorted by a strong police force of the antiterrorism unit. The hunger striker has been kidnapped without being given the chance to take his clothes, his belongings and his medications. The prison is not open yet, since there is a fear for the reactions of the prisoners. This is the second time within the last month that the antiterrorism units invade the prison and kidnap a prisoner from the A wing of Korydallos. All of these take place against the backdrop of a leftist Syriza government that ”supports human rights”. Announcement at 8:53 Prisoners have confiscated wireless radio transceiver and keys. These actions are within the context of mobilizations for the return of the kidnapped anarchist K. Giagtzoglou back to Korydallos. Prisoners demand to speak to a delegation from the Ministry of Justice. Image by Athens Indy media. Immediate fulfillment of his demand for a permanent transfer to Korydallos. Terrorism shall not pass! Previous post: #Helsinki March 3: Everywhere #Afrin, Everywhere Resistance! 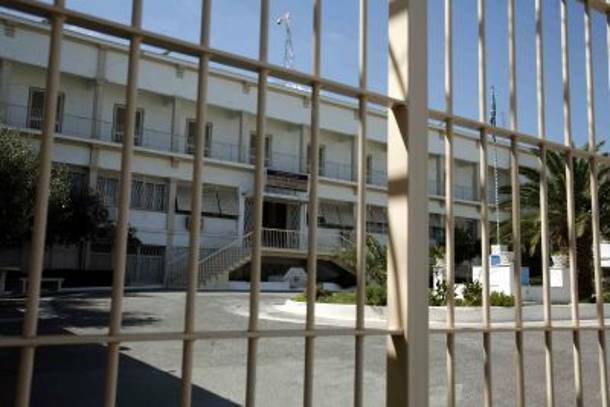 #Greece: Prisoners Protesting for Furloughs in #Larissa Prison Face Threats for Riot-Police Intrusion – Enough is Enough! #Greece: Anarchis Prisoner Konstantinos Giagtzoglou Wants to Start Thirst Strike Tomorrow – Enough is Enough!